1. Tina Colombo, AKA Tina James! 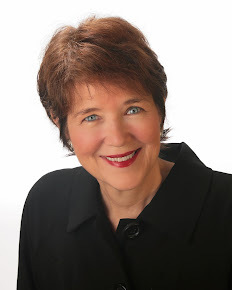 Steeple Hill’s senior editor for the Love Inspired Suspense and Love Inspired Historical line came to ACFW and was a true delight. Tina, who married this summer and thus the name change, is a beautiful, articulate, warm and endearing woman. In the sessions with Steeple Hill, she laid out the guidelines for the three Love Inspired lines and answered a myriad of questions with grace and poise. I learned so much and came away totally charmed by the lovely woman who leads the editing team for the books I write. 2. 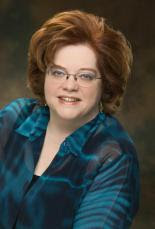 Charlene Patterson, Bethany House Editor! At dinner on Thursday, a lady slipped into the chair next to me. Wanting to get to know those I was sitting with, I asked what she wrote. Charlene Patterson smiled and said she was an editor. Of course, I apologized for not recognizing her, and then we continued to chat about the conference, books and writing in general. We had a wonderful discourse throughout our meal, and I was completely taken by her sweet sincerity. Bethany House authors have a gem in Charlene. I feel blessed to have shared the evening with her and hope we can reconnect at future ACFW functions. 3. My “other” blog is Seekerville, http://www.seekerville.blogspot.com/, where 15 unpublished writers joined together for mutual support in 2005. Two years ago, we went public with the blog that now generates 6,000 visitors a month. For the first time in Seeker history, all 15 of us were together. Of course, we made the most of the conference with a Treasure Hunt for Seeker friends that will lead to a Treasure Chest of prizes in the upcoming weeks. We also met each evening to recap our conference highlights and catch up on Seeker news. 4. Friday night I returned from dinner with the Love Inspired Authors and found none other than best-selling Christian suspense author Ted Dekker in the hotel lobby surrounded by a gaggle of women. Knowing this was a once-in-a-lifetime opportunity, I pushed my way (nicely, of course) through the crowd and asked if someone would take our picture. Ted’s a cutie. Who knew he was so young!!! I’m a fan and now even more so. He asked me which of his books I liked the best. With my love of the World War II era, I quickly answered, “Obsession.” Thanks, Ted, for making my ACFW conference experience so memorable. 5. 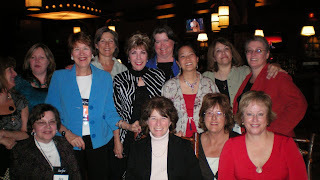 Another ACFW joyful memory was spending more time with Pam. We sat together in a couple of workshops, shared a table at lunch and kept running into each other in the hotel. I was the one screaming the loudest when she won the Book of the Year!!! Way to go, Pam!!! We’re so proud of you!!! I’ll be at Georgia Romance Writers’ Moonlight and Magnolia’s Conference this weekend. Hope to see some of you there! Watch for Debby’s December 8th release, CHRISTMAS PERIL! Since this is my first post here since the ACFW conference, here are some photos from the conference earlier this month. This first one was from the early bird. Almost 300 people participated in this workshop with Don Maas on Writing the Breakout Novel. It. Was. Incredible! Seriously, if my conference had ended there, I would have still received my money's worth. If I'm not a better writer after this -- say it with me -- I'm a lazy writer! I'm in the purple sweater, Jenny B. Jones is in front of me looking away from the camera, and fellow Hoosier Ronda Wells is next to me. 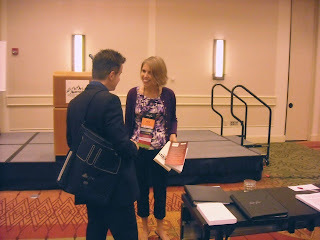 This next photo is one Dr. Richard Mabry snapped while Don Maass and I chatted a moment before his introduction. Did I mention that Robin Miller (check out the trailor for her book on her site) asked me literally two minutes ahead of time to introduce one of the most famous men in writing? Ack! Fortunately a lady right there in the front row had both of his writing books, so I grabbed them and started talking. Seriously, who wants to hear me blather on when a man with his wisdom is in the room. 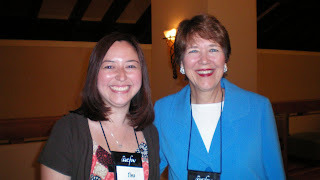 Then this is a photo of me with writing pal Tina Forkner. One of the best parts of conference is connecting with friends I usually see at conference if at all. Tina is an amazing writer and her personality is so fun! Her daughter is a year older than Abigail and a level six in gymnastics so we had fun comparing notes. I had my camera but didn't take any pictures. Instead, I loaned my card to Mom and Janna so they could take photos. I need to email those to Janna ASAP. 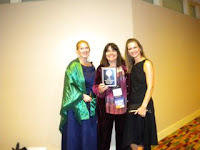 I Won Book of the Year for Short Romantic Suspense! Pamela Tracy here. Yeah, the one in the middle holding the plaque. (I'm standing between my roommates Lynn Rush and Avily) Ya know, it's hard to toot your own horn. It really is. But, if you can't say, "Hey, I did won this award for romantic suspense!" on the romantic suspense blog, where can you say it?" Here's the story. Last year, Broken Lullaby came out. It's the third in the what I call the "Broken Bones" trilogy. At the end of the year, I entered it in a few contests. The two contests I'm most excited about are the RITA, and the BOTY. 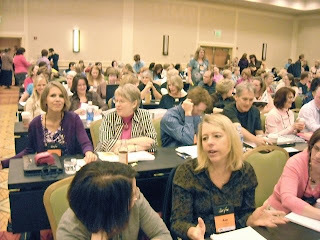 This last weekend, I went to Denver to the conference hosted by the American Christian Fiction Writers. They are a fabulous group; I've belonged for quite awhile. Anyhoo, my book was a finalist. Man, was I up against some most excellent (line taken from Bill and Ted's Excellent Adventure) authors. I was up against Margaret Daley, Dana Mantink, Robin Caroll, and Debby Giusti. Sitting in the audience, looking at my plate, I knew, without a doubt, I would not win (I'd read all of the other books, you see). During t he ceremony, as other winners gave their thanks, I did have enough forethought to jot names on the back of my dinner ticket (The size of a bus pass). I wrote Harlequin, Tina James, Steve Laube, God. Then, Ronie K. got behind the mic. Our pictures flashed on a big screen, and she read the first line. 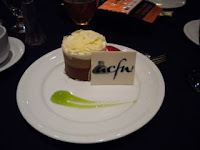 That's how ACFW announces the winner. They read the first line. So, here's the line. "I did not kill my wife." I'm sitting there, thinking, "Hmmm, I wrote a line exactly like that. For the book out now, but not for Broken Lullaby." Then, they read my name. OH WOW, I sent the wrong first line! OH WOW, I won!!! I tripped to the stage. Brandilyn Collins tried to give me the award. I'm pretty sure she finally pried open my hands and inserted plaque. I went behind the mic. Hmmm, my glasses are still on the table so the little piece of paper I'm holding means nothing. I can't see a word. I squeak (literally squeak... there was definitely a squeaking sound warbling through my acceptance speech - I was helpless to make it go away) out a thanks (forgot husband - don't tell) and then I went down the stairs where a woman waited to take my picture. I'm pretty sure she gave some directions, but finally she walked over and physically turned me so I was facing the camera and not the wall, and snap... the winner is photographed. Once that was done, I walked right out of the auditorium ((Okay, I'm pretty sure I looked like Forrest Gump as he headed off the football field and to the locker room.) In the atrium, Rhonda Gibson handed me her phone (she'd been calling home yelling She'd WON) so I could call my husband and squeak (I can't yell; only squeak) that I won. Then I went to the bathroom and cried. 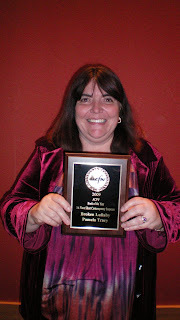 You know, besides thanking my husband, I needed to thank all the Love Inspired Suspense Writers. The only reason I was able to win such an award is because of the books all the LIS writers put out. They've built the line, built the readership. The imprints of all the LIS writers surround me. So, there's the tale of this years BOYT winner for short romanctic suspense. Oh WOW. Today we're welcoming Erin Cole, the heroine of FINAL EXPOSURE by Roxanne Rustand, released this month (September, 2009.) Wow, you've just had quite an adventure. My personal experience with suspense began when I was a child. My two cousins and I were best friends with another little girl who was abducted and murdered. Her death was horrible enough. The nightmares, after she was found buried in a shallow grave, were worse—made all the more terrifying because her killer wasn’t found for a long, long time. We all dealt with the grief and terror of those times in different ways. I moved away from Montana right after high school and never looked back. Never dreamed I’d ever return for any reason, except for brief visits with relatives. And why would I? The old nightmares continued to slither back into my restless nights at the most unexpected times…especially whenever I went home. But finally, it was time to make peace with the past. To settle my feelings over that tragedy as an adult. And, my elderly grandfather wanted to retire and sell my grandma’s little general store in a tourist area up in the mountains. 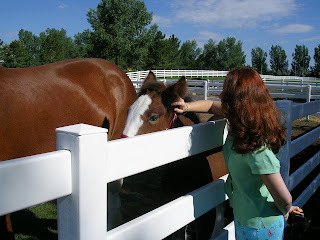 With no buyers and failing health, he was struggling, and I just had to help him--even if it meant going back to the place where my nightmares all began. I’m glad I did. But I sure didn’t expect that there would still be terror lurking in the darkness when I returned. 2. So, during the book you met Jack Matthews. Tell us a bit about him. What was your first impression? When did you know it was love? Well...I sure didn't expect expecting tall, dark and mysterious landing on my door--or the fact that this guy would have a young boy with him. There's something so...well, just so sweet and touching and heroic about a big guy, who has no clue about being a father, trying his best to parent a little orphaned child. Just watching Jack with Max made my heart melt. I learned to take care of myself, over the years. To be independent, and strong, and determined. My greatest weakness was perhaps also a strength, in a way. It was my deep fear that someday, a killer would come after me, and I'd be helpless--just like my childhood friend was. That emotion drove me to take self defense classes, and to develop a stronger sense of wariness and self preservation. If I hadn't nurtured that side of me, I would've been dead by now. Strangers. Dark, shadowed places. Fierce storms at night, when I wouldn't be able to hear footsteps creeping around the outside of my house. But, I'm much better now. If you'd asked me earlier, I'd say that I wish I'd been a better judge of men, in a romantic sense. But now? I think every step of my life has been part of God's plan for me. That everything unfolded as it should. If I had settled for Mr. Almost Right years ago, I never would've met Jack and Max. I've always believed in God. But when my best friend was viciously murdered, that shook my trust. If God hadn't stepped in to save her--a sweet, good girl like her--how could he care at all about me? But I've learned things now, and my faith is so much stronger. I had clung to my childish view of the world and of God's love way too long. Men are still capable of evil. They have free will to commit horrible crimes. But God is with me every moment of every day, filling me with a sense of love and reassurance. And I see now that my prayers have always been answered in so many ways. This is one of my very favorite Bible verses. It's one that I try to live by, every single day...and it fits perfectly with the lessons I learned after Jack came to town, and all the trouble began. Ohhh, I love orea's too. Thank you Roxanne for sharing Erin with us today. This sounds like an exciting read. Safety. Serenity. That's what Jack Matthews wants, and what he seeks in Lost Falls, Montana. A quiet retreat is just what Jack and his orphaned nephew, Max, need—especially with gentle, beautiful Erin Cole as their host. But when sirens in the night leave Max screaming, Jack's faced with the harsh truth. They're not safe—not him, not Max and especially not Erin. What is she hiding? What does the shadowy figure stalking her want? And how much will Jack have to risk to keep her safe? Hello! Lisa Mondello here to talk about a few things. First off, by the time you read this post, the manuscript that I've worked round the clock and ignored housework for will be sitting on my editors desk. 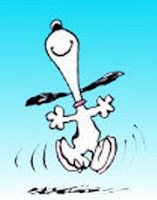 This manuscript was a long time coming and I'm thrilled (doing a happy Snoopy dance really) that it is done. You see, this past year was pretty trying for me. With the deaths of 3 prominent women in my life (my stepmother and grandmother within 36 hours of each other, and then 6 weeks later, the death of my mother-in-law) it was hard to get my feet back under me to write. Add the fact that the oldest of my 4 children has just left home for college and...well, let's just say I've been a little weepy. But that's life and deadlines keep coming whether life is happening or not. I'm no stranger to deadlines. By day I'm a freelance writer and work on tight deadlines all the time. Most of the time, I can balance my freelance and fiction writing enough so I don't drive everyone in the house crazy. Sometimes it's not so easy. For a writer , finding time to balance life issues, family and writing can be difficult. I'm fortunate enough that my day job doesn't require me to travel great distances each day. The furthest I commute is from the coffee pot to the desk. I think I can do that in ten paces. (I just checked and it's 14. I have short legs!) And while I don't have a commute to dig a hole in my writing time, I do have 4 teenagers that need me to drive them all over the place whether it's to work or various school activities. It's not uncommon for me to be waiting in my minivan (need that with 4 kids and a dog) for a half hour waiting for a child. During my stressful year, I'd forgotten the strategies I'd used to maximize my writing time when the kids were much younger and needed my watchful eye all the time. Recently I had a discussion with my husband about how I used to get so much done then and why it was so difficult now. And then it hit me. These past few years I've gotten spoiled by having long stretches of time to write while the kids were in school. That works fabulous for my freelance writing, but it's not always easy for my fiction writing that requires more development and more creativity. But years ago, I knew I only had a finite amount of time to write and would write in short spurts. 1 hour, 30 minutes and even as little as 15 minutes. I'd plot my stories while I was driving to the grocery story or folding laundry. I'd keep index cards in my purse and jot down character traits and little snippets of dialogue to remember so that when I was at the computer I could write. And then my husband gave me something wonderful. He bought me a Dana. The Dana is a grown-up version of the popular Alphasmart. I used the Dana several years ago but when I started working at home full time, it began to collect dust. I recently pulled it out and dusted it off. Now I bring my Dana with me everywhere. When I find idle time in the car, I turn it on and start typing. A 20 minute wait for my daughter to get out of work can produce 2 rough pages. By the time I get home, upload those pages and quickly edit them they can turn into 4 or 5 pages. Not bad for just sitting in the parking lot waiting. I'm back to using my idle time to exercise my creative muscle and use my Dana to fill in times when I can't be at the computer. It feels really good to be writing again. What is it that you do to maximize your writing time? I'm all ears about new ways to time crunch. Always the Sidekick . . .
Ramona here, and after a rough month in August, September has been a month of new beginnings. I started a new job (teaching an American Lit class at a local college), finished a couple of major projects, and worked on the manuscript for the next Love Inspired Suspense. I also renewed an old friendship, which has been an amazing joy. Sharon and I have been friends since high school, providing me with one of a dozen or more opportunities to be a bridesmaid. I started this long collection of one-time dresses at 19, in this red beauty, when my friend Denise married her sweetheart (and they are still together 33 years later). I’m actually a good bridesmaid, just as I am a sidekick. With most of my friends, that’s what I do. Never the heroine, I’m the one who cracks the jokes, brings extra food, and occasionally points out the clue the hero just stepped over. Men think of me as a sister; woman love to confide in me. This is OK, believe me. It’s a great position to be in for taking notes, finding fresh angles, and telling the tale around the campfire. After all, the heroine and hero are too classy to brag about their exploits. That’s for the bard, the sidekick. Like Mr. Gibbs to Captain Jack Sparrow, I’m the storyteller. So pull up a log and gather ‘round the campfire. Starting next month, I’ll have a Field of Danger to tell you about . . . I just got back from the ACFW conference in Denver, so I'm still catching my breath. I had a great time and came back refreshed and ready to tackle the final edits on the book I've been working on over the summer. While I was there, I attended a workship called "The University of Fiction Five Hour Degree" held by Karen Ball and Allen Arnold. Well, I say I attended. I missed the first session because I was scheduled to work the registration desk. But that's okay. I enjoyed chatting with people who dropped by, asking questions that ranged from "Where's the bathroom?" to "Where in the world is this workshop?" to "I don't think I'm registered but I'm supposed to be here." You learn a lot at the registration desk. But back to the workshop. I learned from my roommates Winnie Griggs and Marta Perry (who both did attend the first session) that as writers in today's world, we all need a tribe. This premise is based on the book "Tribe" by Seth Godin. Basically, it's a word of mouth community that follows us and passed the word about our books. It's all about social networking, blogging, twitter and anything else we can do to get our names out there. I'd never thought about my readers and friends as a tribe, but I like that concept. After all, it takes a village... right? But what does this have to do with writing suspense? Well, everything. We work hard on our books and we work hard to do all the right things as far as marketing our books? But how do we know if our tribe is tight and if we're doing the right things? I've always touted word of mouth as the best form of adversting. I learned this after working in marketing for many years and taking all sorts of marketing classes in college. But ... having been raised to be meek and mild (I know some of you are laughing at that) I've never been comfortable tooting my own horn. I was taught it's not polite to brag. People frown on it. Now I have to retrain my brain to brag just a bit. Maybe marketing isn't bragging. Maybe it's just getting the word out that you have a story to tell and you hope people will like that story. After all, there are a lot of horns out there, and all of them seem to be loud and colorful and in your face. Maybe my little horn does need tooting??? So, when we write our romantic suspense books that involve danger and intrigue and hopefully a happy ever after, too, we try to make our stories compelling, believable and entertaining. But we also try to add that faith elements that helps our characters get through the worst of circumstances. I guess in the end, our tribe begins with our faith, our churches, our families, our communities, and our world. We then branch out, offering our stories to the world at large. And that is as scary as any suspense we could ever write. So ... what do you think about having a tribe? Whether you're a writer, a stay-at-home mom, a nurse, a minister, a secretary or a retired senior citizen--we all need a tribe, right? Fascinating subject and one I intend to explore. Even if I missed the workshop, I know my tribe will always be there to offer me advice and encouragement. Thank goodness! Today is my day to post, but it's hard to think of what to write. 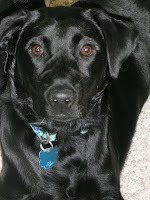 My heart is back at the vet clinic, where our five month old grandpuppy is clinging to life. She went in to be spayed on Monday, but reacted badly to the anesthesia, and then her blood didn't clot normally--even though her pre-op blood tests were good. The vet thought she might be seeping blood somewhere, but she couldn't have exploratory surgery and risk anesthesia again. By evening, her labwork wasn't looking good, and the stress had sent her into acute kidney failure. 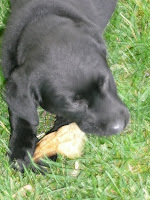 There was thought of doing a transfusion, but that can bring its own risks for severely stressed puppy. My son and I stayed all evening, then were back there at 7:00 this morning, my heart breaking...and I'm sure his was, too. We are so blessed to have an excellent, dedicated vet. He stayed with her all night at the clinic, adjusting meds, checking her labs. This morning she looked awful--so edematous that her back legs looked like balloons and it was hard for her to move. Her labwork was worsening. The Lasix wasn't working. This morning I prayed so hard for her to improve....for her kidneys to start working before it was too late. The vet did more labwork and gently warned us that things weren't looking good at all. Then suddenly, the most recent dose of Lasix worked. She started peeing like crazy, which is just what she needed to do. But she isn't out of the woods yet. She's diuresing, but her kidneys still aren't working right, and could fail altogether. She is still under close veterinary supervision. 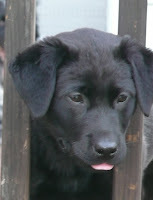 And I am still praying that she can overcome this to return to her wildly joyous, boisterous puppy ways. You could never convince me that there isn't great power in prayer...even when it involves one of God's smallest creatures. There have been countless times in my life when my prayers have been answered in the most amazing ways--sometimes in ways far, far better than I prayed for. And sometimes, those answers come in comfort and peace when a miracle just can't happen. Little Abby, who visits our house a lot and often has sleepovers when our son has to travel, holds such a big place in my heart. She is so young, with so many years ahead of her. Years with our son, if they are granted, of absolute devotion, and love, and companionship. I know that she is receiving the best of care, but I'm also praying for her....and giving thanks for the dedicated vet, who has now had to go through a full day of work with no sleep at all. He is a hero, in my book. How about you...have you been through some tough times with your pets, but still had a good outcome? It would be nice to hear some uplifting stories! The last time I posted I talked about fears. I mentioned one of my fears was snakes. A few days ago when I went outside in the front yard to check out the beautiful white butterfly flitting around the butterfly bush (butterflies and hummingbirds love that plant), I walked across the grass barefoot. I was standing there staring at the bush, hoping the butterfly would light so I could get a good look at it. I hadn't seen a white one like that at the bush before. Something tickled the top of my toes and foot. I thought it was the grass since it hadn't been cut yet because it's been raining so much. I happen to glance down, and it was a snake sliding over my foot. Thankfully it was only a foot long. But a snake is a snake, even if it looked like a baby one. At that moment I jumped back and looked around for its mama. I don't think my heart stop beating fast for a long time after that. I learned a few lessons that day: don't walk barefoot across the grass, look down where you walk (I could have stepped on it and that thought makes me shudder), and check out the yard before going across it. Have you ever had a close encounter with one of your fears? 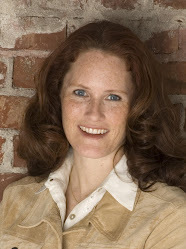 Today we're welcoming Catelyn Clark, the heroine of A SILENT FURY, by Lynette Eason, September, 2009. Wow, you've just had quite an adventure. I’m a homicide detective with the local police department. When someone dies, I usually get the call. Only this time I was caught off guard when the killer decided to come after me! 2. So, during the book you met Joseph Santino. Tell us a bit about him. Joseph is an FBI agent who was in New York. He can be quite infuriating, I’ll tell you that right off. That he hadn’t changed one bit than the last time I saw him—which was two years ago. When did you know it was love? All right, time for some honesty, I suppose. I’ve always been in love with Joseph. From the time I was a teenager up until I saw him again at the murder scene. We’d almost gotten engaged two years ago, but I…um…sort of messed that up and he left. After I sort of told him to. I didn’t really want him to go, but didn’t know how to tell him that at the time. So he left…and took my heart with him. I’m tenacious. I’m good at what I do, which is catching killers and I’m loyal to a fault. What is your greatest weakness? I jump to conclusions sometimes and can hold on to a grudge better than any pit bull. A stupid thing to do in my profession, I know. I think I was really disillusioned there for a while and just had to find a way to deal with the pain in my life. But God is good and He brought me through it. Loving and then being left. I wouldn’t be so cynical. I hide it pretty well in some instances, but I don’t trust easily. I want to be more open, more willing to accept people at face value instead of looking for their bad side. I’m mad at God and don’t even really know it. I’ve come to realize that God is who He says He is and I’ve changed on the journey to that understanding. I like myself and the fact that I can love and trust Joseph in a way I never thought I’d be able to. Psalms 37:8-9 – “Refrain from anger and turn from wrath; do not fret—it leads only to evil. For evil men will be cut off, but those who hope in the Lord will inherit the land.” I had to learn to deal with my anger in a way that was honoring to the Lord. I had to turn away from bitterness and unforgiveness and that was a hard lesson to learn, but God is good and because I was obedient to Him, he blessed me in ways I never imagined. Probably a lemon meringue pie. Because I can be sweet and tart all at the same time! Thank you for sharing Catelyn with us today. This sounds like an intriguing story. A Silent Fury: Tragedy strikes Palmetto Deaf School—twice. With one student murdered and another missing, it's up to homicide detective Catelyn Clark to find the killer—and probable kidnapper—fast. She'll even work with her ex-boyfriend, FBI agent Joseph Santino, to solve the case…while keeping her distance. Relationships between cops never work; her parents taught her that. They also taught her that the only one she can rely on is herself. But when the killer starts targeting Catelyn, it's only by opening her heart to faith—and love—that she can finally bring the silent fury to an end. Hey, readers. 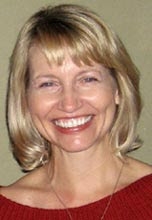 This is Leann Harris. I am in Denver as I write this at ACFW yearly conference. I am in heaven. Why? I grew up in Denver and love the city. It is a city where you are never lost. It you can see the mountains, you know what direction you are going. The mountains are West. I also love the smell of Autumn. There is something in the air—someone once told me it was sage--that is the most wonderful smell. When I smell that aroma, I know Fall is upon us, and colors are wonderful. The yellow of aspens, vibrant red and orange of maples. Where I live now, there is no such thing burst of color. Also in Denver, you can smell rain. It is the sweetest of all smells. I’ve lived in Houston and you can’t smell anything. And the last thing I love about Denver is you can see the stars. My children have never really seen the Milky Way. When I was a kid, I’d lie out in the summer and find all the constellations. So what am I going to do this week? Go outside, smell the wonderful smells the Autumn, look at the night sky, maybe drive down the street where I grew up or go up into the Rockies and let my heart sing. If I could convince my husband to move, I would. But I’m not holding my breath. My own summer and I'm sad to see you go. Linda wrote yesterday about summer. Wasn't that a great pic of her! It prompted me to ask myself how I spent the summer. We had a lousy start weather wise and up here in New Brunswick, Canada, we depend on the weather for summer. We only have a couple of months and when one of them is riddled with cold wet weather, we grumble and growl. August was lovely. We had hot weather and I moved my daughter's potted palm outside, and created an oasis for myself on the front deck. And like Linda, I wrote. I'm still writing, still on a deadline, and still sweating bullets to get that story out. We also raised money for a mission trip that will happen next year. We went to a lovely local market every Saturday morning and sold pickles, bread, birdhouses, handmade dishcloths, and windchimes. With folk music playing and the scents of barbecued sausages in the air, we had it made. My hubby would treat me to a coffee and a samosa, or some sushi from a friend who also comes on Saturdays. But my latest work in progress is not set in a local market, and my heroine doesn't breathe in the scent of coffee, sausages and samosas. She isn't relaxing and talking to everyone and telling them about our fundraiser. She's in sweltering Florida, and right now her life is being revised. And as fall slips in, our weather revises itself, our deadlines loom and deadly situations rise and fall in my manuscript, I say goodbye to summer. We've had our first killing frost, and the geese are flying overhead. Goodbye summer. It was nice enjoying you. How did you spend your summer vacation? Remember those essays we would have to write on our first day of school? So, how did you spend your summer vacation. I spent mine - Writing. I never stopped writing. 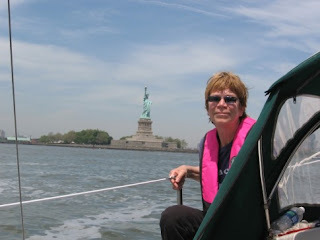 We have a sailboat and we sailed up the east coast in May and June. Then it was back down to the RWA and a family wedding on the Outer Banks of NC in July. Then it was home to more sailing. One of the highlights was having our 6 tear old grandson stay with us. We had so much fun that week. So, why did I say ‘writing’. I guess it’s because we writers never turn our brains off. On the boat, I had my notebook with me. Down in North Carolina I spent a lovely afternoon on the beach - working on my novel. And if I’m not actively writing, I’m coming up with ideas and more ideas and writing them down. On long car trips my husband and I brainstorm. I’m sure we’ve had a few waitresses wonder at our restaurant conversations. Ah, the conversations we have! So, even when I’m sitting watching dolphins swim beside our boat, even when I’m admiring the scenery, there is a part of my brain which is always ‘writing.’ I think that’s the curse - or blessing - of being a writer. And what fun! I met up with fellow Steeple Hill authors, Louise Gouge and Susan Sleeman. We had lunch Wednesday at Wolfgang Puck's restaurant in Downtown Disney. I highly recommend that place if you're ever there. I got the chicken fettucine alfredo. (Or however you spell it.) Fabulous! Then we all came back to where I was staying and had a mini brainstorming session and a lot of chatting. What a great time of getting to know some wonderful ladies. And we didn't take one stinking picture! Sorry. So anyway, back to something I learned this week. I can't leave the writing behind. Oh no. It was with me through every twist and turn. Standing in line at Disaster, I plotted out an entire story. Yeah, see, there was this man in line. All by himself. He had on khaki pants, KHAKI PANTS, y'all. Come on, who wears PLEATED khaki pants to a theme park?? And dress shoes. Uh huh. You read it right. Spit shined black leather dress shoes. And a LONG SLEEVED patterned shirt. It was ONE HUNDRED DEGREES! I had on shorts and short sleeves and was sweating buckets and this guy had on what I just described to you. So, I'm watching him. And he's watching the people in front of us. And I'm thinking: This guy is going to blow up the ride. SERIOUSLY! I continue to watch him. He's just standing there. And I'm like getting nervous. My husband asks, "What's wrong?" I whisper in his ear, "That guy right there?" Hubby dutifully turns to look and I grab his chin and hiss, "Don't look!" I say,"He's gonna bomb the ride. See, it's a plan. He's one of a group of terrorists who've planned to blow up all of the scary rides at the park and they're doing it all at the same time. I bet their watches are even synchronized." "Oh, okay. So, do you have your pen and paper?" "Be sure to take notes, you might can use it in a book." "I'm not getting on that ride if he does," I say. Hubby laughs. "You've got to be kidding me. We've been standing in line for 30 minutes." I wasn't kidding and I didn't care how long we'd been standing in line. If he got on the ride, I was walking the other way. The guy reaches into his pocket and pulls out...his Blackberry. He answers it and shoots out of line to go running down the sidewalk! NO, I'm NOT kidding. I look at hubby, he looks at me. I shrug. "I guess their plan was aborted for some reason." "Uh yeah, I guess." A pause. "So, are we riding now?" Ah, the mind of a writer. I could go on and on with more examples of how my mind never shuts off. Ideas are everywhere! And I can't seem to stop gathering them no matter how hard I try. And to be honest, I guess I don't try very hard. Maybe one day I'll be normal again, but...I'm not holding my breath. So, do you have days like this? Where were you when inspiration struck you and had to laugh because only a writer would come up with it? 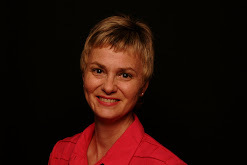 Today we're welcoming Anita Teel, the heroine of Race to Rescue, Dana Mentink’s September release. Wow, you've just had quite an adventure. 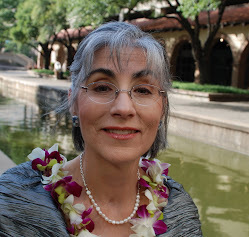 My name is Anita Teel and I’ve spent my career researching endangered bat populations all over the world. While in the Seychelle Islands, I got a call from my brother. The connection was bad but I heard just enough. He was in trouble and I knew I had to return to Arizona to find him. He’s all I have left. 2. So, during the book you met Booker Scott. Tell us a bit about him. What was your first impression? When did you know it was love? Oh boy. Booker was the last person I wanted to see when I returned to Arizona. During our last encounter I basically broke his heart and ruined his livelihood, but that’s another story. It took almost losing myself and my brother to enable me to see Booker for the honest, gentle soul that he is. I am ruthlessly determined, which is both my greatest strength and my greatest weakness. Trusting the wrong man again and losing my brother. I would a calmer person, a person who is led by the head and not the heart. I am very sure of my faith at the beginning of my adventure. In actuality, I use my faith as a means of judging other people, a fact that I’m not proud of. It’s was a difficult process to let go of the bad things that happened to me in my life. It took almost dying in the desertand losing Booker for me to realize that God never left me, and He’s always been working for my good. Gingerbread, because it’s sweet but with a hint of spice, just enough to warm you up inside! Dana, thank you so much for sharing your story with us. Interesting and exciting! Can't wait to read it. Those were her brother's last words before their phone connection was lost. So Anita Teel rushes to Arizona to find her only relative right away. But no one—from his employer to the police—will take her seriously. Except for Booker Scott, the hardened rancher whose heart she broke. Now, Anita has no choice but to put her fragile trust in Booker once again. As they race across the deadly desert, the rescue mission becomes a test—a challenge to see if they can overcome their pride, and their past, in time to save her brother's life. Carol Steward here. We all have them, days that bring back memories so vivid that we get goosebumps all over again. Today is one of them. For those who weren't alive during WWII, or even those of us who were tiny when Kennedy was assasinated, this is the event to equal Pearl Harbor. Even though I live in the Rocky Mountains, my editors are in New York City. In many ways, lives of those I dearly care for were touched by the events of that day as well. I remember the stoplight I was sitting at when I first heard the news of 9-11. I was a few minutes late leaving for work, so I first heard the news of an airplane hitting the World Trade Center on the radio. When coworkers arrived a few minutes later, with the news of the second hit, and the hit to the Pentagon, we were stunned to silence. Then the crash in Pennsylvania. It is times like this that bring out our faith. We gathered in prayer, in our public office. No one could focus on work, though we stayed together, in our state of shock as we watched the worst suspense story unfold like an unwritten script. Except it was very, very real. Even that night in my sleep, it was my first thought when I heard an airplane flying over the city. There was a no-fly order. Who was it? Probably a military plane. And the chills went on - for days, months, years. Eight years now, another day in history that changed our nation. Want to be a Writer??? Then this information is for you! 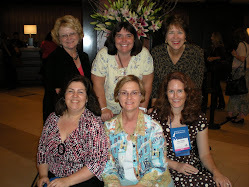 Many of the CRAFTIE Ladies are headed to the ACFW conference in Denver next week. I leave on Tuesday! Yipes! This conference and organization is why I am a published author -- hands down -- well, add in some hard work and creativity, but I know I wanted have the books out or releasing that I do without attending the ACFW conference. So read on, if you're wondering how to get started. 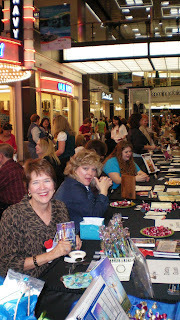 "The Premier Christian Fiction Conference"
Bestselling authors, publishing industry representatives, and newcomers to Christian fiction writing will gather in Denver at the American Christian Fiction Writer’s annual conference September 17-20 to compare notes, learn from each other, and encourage one another in the pursuit of publishing goals. This year’s conference theme , Standing Firm…Moving Forward, will especially inspire the full range of talent and dreams in the ever-changing publishing world today. This amazing conference will feature representatives from major publishing houses like B & H, Guideposts, Zondervan, Harvest House, Barbour, Steeple Hill, Summerside Press, Bethany House, Waterbrook Multnomah, Marcher Lord Press, Tyndale House, and Thomas Nelson, and top literary agents who will meet with writers and identify promising proposals from both new and veteran novelists. Conferees will have access to publishing panels, professional critiques, and customized workshops based on skills and interests. 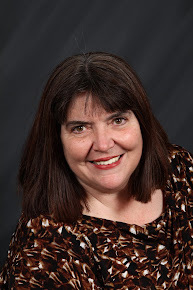 The keynote speaker is New York Times bestselling author, Debbie Macomber, who has more than 100 million copies of her books in print worldwide. 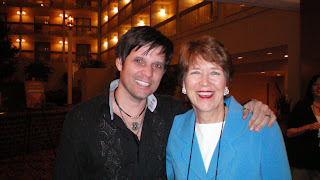 Learn more about the American Christian Fiction Writer’s Conference by visiting www.acfw.com <http://www.acfw.com> . Click on the left sidebar on Annual Conference. I’ll be flying to Denver in a week for the American Christian Fiction Writers Conference. While I’m excited about the workshops I’ll attend and the opportunity to hear the latest information from the various publishing professionals, the best part will be reconnecting with old friends. The Steeple Hill authors are a close-knit supportive group I always look forward to seeing. Most of us keep in touch online throughout the year. Often we help one another when problems arise or when we need advice or encouragement. Many of us consider our writing ministry as well as a profession so there’s a spirit of service and commitment in the group. We share like values and a common goal to provide uplifting stories for our readers. Working together with our editors, we’re dedicated to making Steeple Hill books the best they can be. Yes, we’ll talk about our writing when we gather together, but we’ll also talk about how we can help writers seeking publication. We want to see everyone succeed. First sales are celebrated, and we always welcome new authors into our sisterhood with open arms. If you’re targeting Steeple Hill and attending the ACFW conference, be sure to say hello! We love sharing suggestions on how to make your work shine, and we want to get to know you. Sit next to your favorite authors at lunch or in the various workshops, and even if this is your first conference, don’t be shy. We’re a friendly group and so are the other attendees. Hopefully by the end of the weekend, you’ll have a close group of friends who will support you throughout the year until we all reunite at next year’s conference. Looking forward to seeing you in Denver! Watch for two great holiday stories this December in CHRISTMAS PERIL, featuring Merry Mayhem, by Margaret Daley, and Yule Die, by Debby Giusti. Today is the first day of school for my daughter. Tomorrow the first day for my son. It also marks the passing of a season. Or the ushering in of a new one, depending on how you look at it. This past year was a roller coaster ride and I'm glad for it to be over. I'm looking forward to this new season with anticipation and hope. I can't wait to see what God will do next in my life, my writing and in the world. For me, today is like New Year's day on in September. Have a glorious day everyone and may this new season bring you much joy. It's nearly 4:00 p.m. and I'm finally sitting in front of my computer. I've been without Internet (and cell phone) since early Friday. Yup, that's right. I married a man who loves to go camping and then gave birth to a son who loves to go camping. 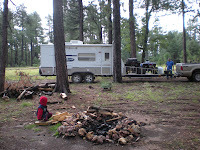 Now that we have a camper (with toilet, stove, television) I like camping too. I write suspense, and often people say, "Where do you get ideas?" 1) Son goes to play amidst the roots of an upturned tree - finds body. 2) Exploring one hundred year old cabins, locked up by forest service, and hear a voice inside weakly shouting for help. 4) While riding quad witness a murder. Flee and escape. Now hunted. Yes, I had all these ideas this past weekend. My husband wonders how I stay sane. 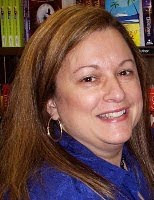 Today we're welcoming Tabitha Beaumont, the heroine of Protector's Honor, by Kit Wilkinson, September 2009 LIS. Wow, you've just had quite an adventure. My name is Tabitha. I'm a twenty-eight year old worker's compensation lawyer and I live in Charlotte, North Carolina. Not too long ago, I decided to enter my first triathlon. As I was running to the finish, a couple of men ambushed be. 2. So, during the book you met Rory Farrell. Tell us a bit about him. What was your first impression? When did you know it was love? Rory is an NCIS special agent. When I met him at the triathlon that day, I definitely felt something. But I wasn't interested in a relationship. I think my strength is that I really love and trust the people who are close to me. I'm protective of them. My weakness would be that it's hard to get close to me. I wish I could be a little more spontaneous, like my roommate Sasha. At the beginning of my story, I was trying to help God take care of me. By the end of the story, I realized He didn't really need my help. My scripture is John 16:33 "In this World you will have trouble. But take heart! I have overcome the world." I love this verse because it reminds me that Jesus is in control, even when I don't understand what's happening in my life. He is in control and will take care of me. I would be truffle--a little tough on the outside but good all the way through. Thank you Kit for sharing Tabitha with us today. This sounds like an exciting read all the way to the finish. Can't wait! It's instinct. When NCIS agent Rory Farrell hears a woman scream, he reacts. But even after he saves her from abduction, Rory can't get the beautiful and fragile Tabitha Beaumont out of his mind. Especially when he finds a connection between Tabitha and his latest murder investigation. She needs protection—Rory's protection—while Rory needs answers Tabitha doesn't even realize she holds. Yet how can he find the truth without betraying Tabitha's trust? Soon, Rory must decide what matters most—keeping his objective distance, or keeping Tabitha, in his arms and under his protection, forever. 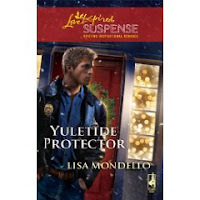 YULETIDE PROTECTOR cover on Amazon.com! As promised, here is the cover for YULETIDE PROTECTOR, my December 2009 release from Love Inspired Suspense. I love Christmas stories. So when my editor asked me if I wanted to write Yuletide Protector as a Christmas story I jumped at the chance. It was a blast to write because it was the first book I wrote using my husband's input. As a police officer, Tom's input was important and it was fun brainstorming the story with him. A DEFENDER FOR CHRISTMAS - Her ex-husband wants her dead? Daria Carlisle can hardly believe it. Detective Kevin Gordon insists it's true...and that it's his fault that her ex is still at large. Which means it's his responsibility to make sure Daria stays safe. He knows first hand that Daria's ex means business. And with Christmas coming, the determined cop intends to give Daria the holiday celebration she deserves - safe and sound by his side forever. Ramona here, and a few days ago, I found myself trying to explain to someone the nature of a “post-book slump.” That’s what happens when a writer finally types “The End” and sends the manuscript off to the editor. You’d think we’d be cheering that it was finished, but many writers don’t. Sure, there’s a momentary elation that we’ve accomplished a goal, but we also sort of shut down and the world seems just a little dimmer. Anyone who has been through the last performance of a play or the final delivery of a project your group has worked on for months has probably felt something similar. The closest analogy I’ve found is that it’s like having a good friend move to another city. She’s still your friend, and you’ll see her again, but it’s not the same. You’ll have occasional visits and phone calls . . . but it’s not the same. For writers, there are line edits and proofreading stages, and the release of a final cover. We’ll promote and write blurbs and do interviews . . . but it’s not the same. So you cherish those moments, and find you want to celebrate them – I often see posts on email loops when someone has “finished the final edits!” Cheers ensue. So . . . this week, I’m cheering. The cover for my December book has finally hit Amazon and the other book sites. 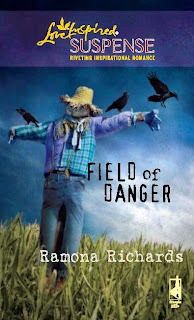 I feel “official!” Field of Danger takes my readers to a new state (Tennessee instead of New Hampshire) and a new set of characters. I adore them, and was glad that this week we could get together for another short visit. Eyewitness to a murder, April Presley wants to answer the deputy sheriff’s harrowing question. But she can’t. She barely caught a glimpse of the crime through the deep Tennessee cornfield, and cannot recall anything to help the investigation. Or can she? Daniel Rivers is certain that April remembers more of his father’s death than she realizes. And the killer agrees. In the race to uncover April’s missing memory before the killer finds her, Daniel is the only one she can trust to keep her safe. Yet will he stay by her side when the shocking truth is unveiled? Did someone mention fear? I don't like to fly but I've learned to get over my fears on that front. I don't like the dark. I have always had night lights in my house. That's because when I was little I lived in an old farmhouse and all sorts of creepy, crawly things used to find their way into that house, especially after dark.